Welcome to our service department where we ensure the word service means service and your beloved 2cv is given the care that we would give our own 2CV. You can be sure that we will carry out all necessary work exactly how you would like. 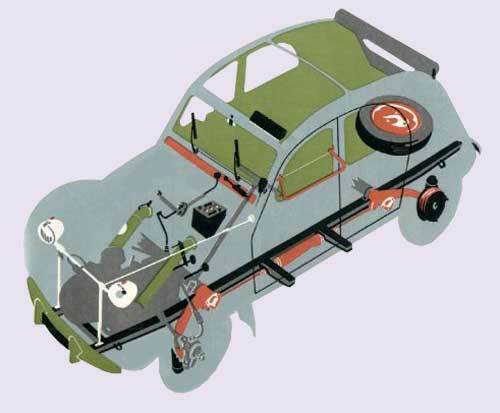 The 2cv is quite simply a wonderful car to work on due to its brilliantly simple engineering design that works as well today as it did when it was originally introduced. Living in the countryside I am constantly reminded of the design's inginuity particularly when driving down farm tracks, through small villages and country roads now with as many potholes to rival anywhere in France! The comfort of the ride comes into its own and with the ever mounting costs of modern motoring, many of our customers have given up their modern cars in favour of something more sensible and thoroughly more enjoyable to drive. For a list of typical servicing jobs and our prices click here.